With Free WordPress Popup plugin by Supsystic you can show popup in different ways – when page loads, after user scrolls page, on exit from site, after user comment. Popup examples. Besides you can show popup by clicking on certain link, button, image or even show it by clicking the Menu item. Just add required code and everything is done! 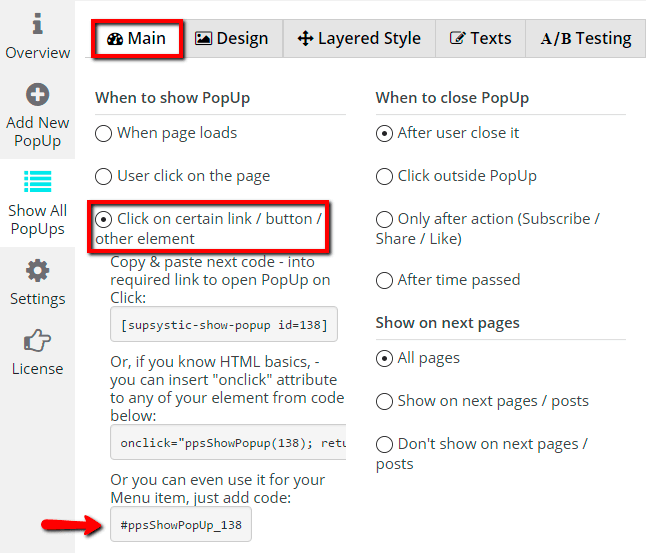 Go to Main settings of WordPress Popup plugin by Supsystic. In “When to show PopUp” block choose “Click on certain link / button / other element” radio button. Copy the shortcode from the first field of this option. Go to your post or page and select required text. Click on create link button in text editor and paste shortcode of popup into the URL field. Check the example – click on me! Add this code to php files of your theme, for example into the functions.php file. In this case IDs of your popups will be uploaded on the server and popups will be shown on your site. What will happen in this case: first step will make PopUp load from server side (database), second step – will bind it show on your link click. Go to Main settings of Popup plugin by Supsystic. In “Whom to show” block choose “Click on certain link / button / other element” radiobutton. In Menu Structure choose item and paste code into the “Title Attribute” field. 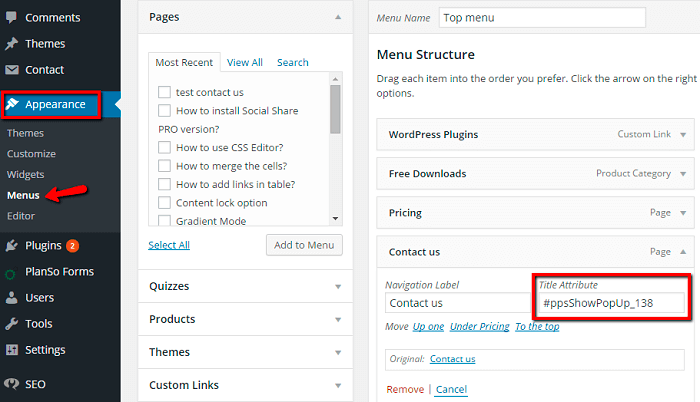 If you want to show your WordPress Popup when user opens your site exactly by link, where in the end will be present popup code – you need to use “On Link Follow” option. Besides you can show popup on link follow with time delay. Read more about “On Link Follow” option here. You want your popup plugin to help you build your mailing list, generate leads, and convert visitors into actual customers. For that, you will need a lot more than just a shiny popup. You will need different kind of option forms, lead generation tools, statistics, A/B testing, and more.